Food gifts are always well-received – particularly if they’re homemade. So why not spend some hours in the kitchen during the frantic run-up to Christmas? Here are our ideas for Christmas food gifts – compliments of the season. Start as early as you can. Look for boxes and tins in which to put your Christmas gifts – charity shops and supermarkets are good places to start. It is often cheaper to buy a tin filled with biscuits (that you can later fill wrap and tie), and eat the contents, rather than buying a tin designed for homemade goodies. Also keep an eye out for ribbon and printed fabric: fabric makes pretty coverings for jams and chutneys. Hold on to any empty boxes, especially if they’re unprinted, during the months before Christmas. You can buy cellophane bags (for mince pies, fudge or toffee) on the high street or from catalogues at national cookery stores, and cupcake or Christmas cake boxes are also available online (try the well-known online auction site). The great thing about this type of gift is that you can make a huge batch to make presents for lots of people at once, saving time and money. Jam is almost always a welcome Christmas gift: try to pick up fruit that’s in season for the best value. At Christmas, cranberries and clementines are in season, and they make good chutney or jam. You’ll find a recipe for fruity compote in Nigella Christmas, or you can make a cranberry-jewelled mincemeat by simmering cranberries with clementine juice, brandy, sultanas, candied peel and sugar. 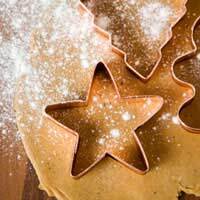 Tie a mince pie recipe to the neck of the jar and give in plenty of time for the recipient to make their pies. What about chutneys? Christmas food lends itself beautifully to a spoonful of chutney, which makes a good accompaniment to cheese boards and leftovers. Look out for cheap boxes of pears (in season) and windfall apples to make a fruity chutney that will be scrumptious with cold cuts and pork pies. If you grow your own, or know someone who does, then keep a box of shallots when they’re harvested in early autumn. Once dry, peel them, soak them in brine, and pickle them in prepared malt vinegar, with a spoonful of sugar in each jar – for the easiest pickled onions ever. Perhaps you’d like to give a food gift, but you don’t have the time to spend in the kitchen? Don’t worry. Here are some ideas for quick gifts with all the homemade wow factor – but less of the stress. Mincemeat Swirls: If you’re doing the Christmas visiting rounds, rustle up some warm Mincemeat Swirls to take along in paper bags. Unroll a sheet of ready-rolled Puff Pastry (500g) on a baking sheet, with the long edge closest to you. Open a jar of mincemeat (and if you like, stir in a finely-chopped eating apple and a splash of extra brandy!) and spread it carefully all over the pastry, leaving an inch border at the edge closest to you. Starting at the opposite side, roll it towards you to make a swiss roll shape. Brush the roll with egg and press the edge on to seal. Now turn the roll so the seam is underneath and, using a sharp knife, cut 1cm slices from the log. Put these onto a greased baking tray and bake for 15 mins or until golden. Dissolve a little icing sugar in orange juice to get a sticky glaze and brush it all over the cooked swirls. Caramelised Chilli Nuts: This is an easy option that takes no more than ten minutes over a wok. You’ll need 500g mixed nuts – make your own mixture of pecans, almonds, macadamias and cashews. In a wok, heat 2tbsp brown sugar, 1tsp chilli flakes, and 1tbsp salt. When the sugar is almost all melted, throw in the nuts and toss quickly to coat. Keep stirring until the nuts are toasty and well-coated, then cool on a baking tray. Put the nuts into an airtight jar; they will keep for three weeks. Schnapps: For a spirit-drinker, why not make some fruit schnapps? Essentially vodka which has been infused with fresh fruit (like pears) for two or three months, it’s easy to make and tastes as if you’ve worked hard! Mulled wine kit: Tie a small muslin bag of spices (available prepared, or buy muslin and measure the spices yourself) to a bottle of fruity red wine, with a wooden spoon and instructions.